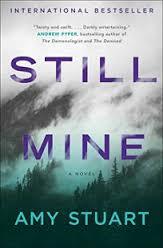 Still Mine is a quiet sort of thriller. Clare is hired to find a missing woman in the mountains by a mysterious man. Clare herself is mysterious, it's hard to understand exactly where she came from or why she feels this is the best course of action for her in the beginning. Despite all of that though, Stuart quickly drops you into her reality. Clare is on the run and is looking for a woman who may be on the run, may have been abducted, or may have been killed. The setting really adds to the overall creep effect; it's isolated, creepy, and dark. The town is still recovering from tragedy and pulses with desperation. These all reflect Clare's own internal state of mind, barely surviving tragedy herself. She gets drawn into the townspeople and regularly questions who she can trust as she continues to investigate Shayna's disappearance. Her own instincts fly in the face of what everyone is telling her. I enjoyed this book quite a lot despite the fact that it had a certain "unreal" quality to it. Clare's situation on the surface was certainly real enough but her whole mysterious employer was harder for me to buy. Still, the circumstances of the town and her quest to find Shayna were enough to keep me with this book and come back to it when I had to set it aside for some time. The ending is also worth it! The writing is also a touch above what you might find a general thriller.